The thesis: rural America is struggling economically and losing residents to urban areas. 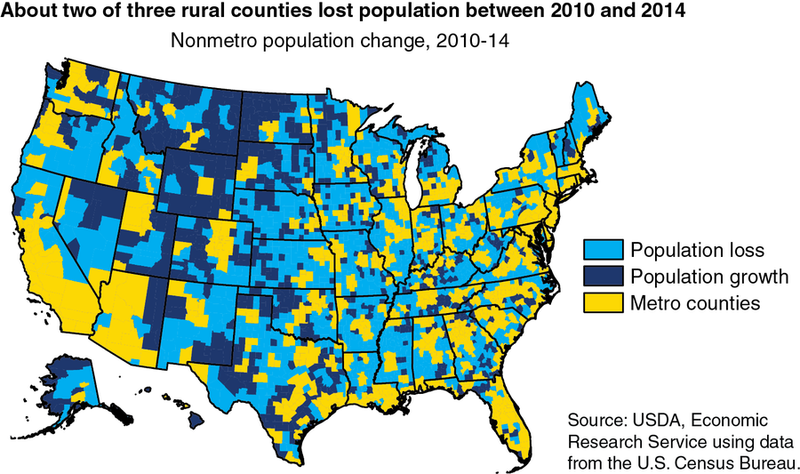 Declines in population in rural America. The U.S. Department of Agriculture published a report this month, “Rural America at a Glance 2015 Edition,” which looks at the statistics on America’s rural economy, including employment, population numbers, poverty trends, and education. The thesis: Rural areas continue to experience greater population loss and poverty rates, and lower educational attainment than their urban counterparts. This is the first time since about 1950 that we’ve seen an overall decline in the population as a whole in rural America. Kusmin says that while regions dependent on farming (along with manufacturing and resource extraction) are seeing a decline, other rural parts of the country concentrated in scenic areas – including the Rocky Mountains and southern Appalachia – as well as in “energy boom regions” like the northern Great Plains have actually experienced some growth. Employment is an important indicator of economic recovery, according to Kusmin. In rural America, the pace of employment growth increased a percentage point in 2014 after stagnating for two years. 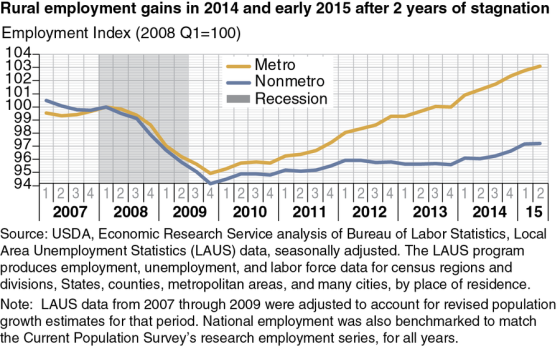 While that’s a great thing, the numbers remains below those that preceded the Great Recession (2007 to 2009). Employment in these regions is still below the 2007 peak. 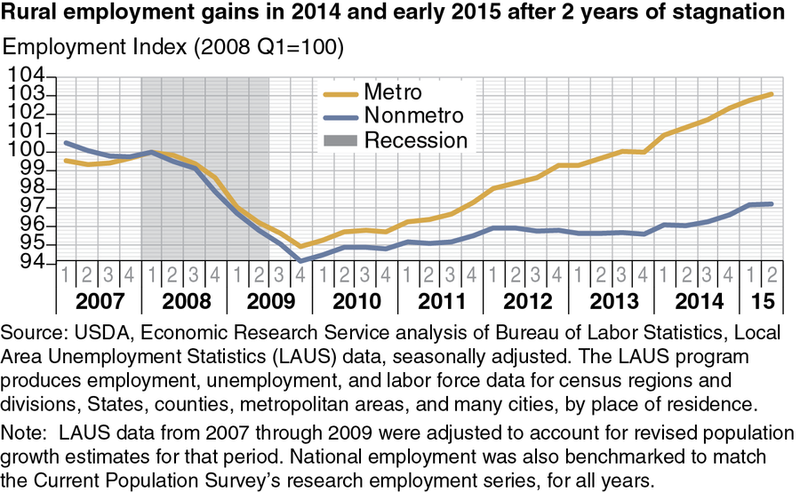 In urban areas, by contrast, employment has continued to rise since 2011 and is now above its pre-recession high. Kusmin’s most-surprising finding was the high incidence of deep childhood poverty. It’s no surprise that poverty rates for rural children had a large increase during the Great Recession, jumping up nearly three percent in only two years and reaching 24.2 percent by 2009. But strangely, it has continued to rise, reaching 25.2 percent in 2014. When looking at what’s considered “deep poverty” – families earning less than half of the poverty threshold – the numbers rose by almost 4.5 percent between 2007 and 2014. The increased rates of rural childhood poverty are linked to high unemployment rates, the decrease in both working-age adults in the labor force and in earnings for low-wage workers, and the continuing growth of single-parent households, according to Kusmin. In general, the poverty rate in rural America in 2014 is higher by 3 percent in rural areas as compared with their urban counterparts, 18.1 and 15.1 respectively. Both were slightly lower than the previous year. A big indicator of childhood poverty is the educational level attained by these children’s parents, since adults without a high school diploma are much more likely to be poor because of limited job opportunities. The good news is that the educational attainment of people living in rural areas has improved greatly over the years. The proportion of residents without a high school diploma or equivalent (GED) dropped 9 percent between 2000 and 2014. During that same time period, the number of rural residents who have at least some college under their belt, or have an associate’s degree, has gone up by 5 percent, surpassing the corresponding proportion for urban areas. But even with the advancement of education in rural America, unemployment, low earnings for minimum wage workers, and other factors have kept childhood poverty rates high. Another disparity between urban and rural areas can be seen in the number of people attaining four-year college degrees. In 2014, urban areas overtook the rural ones by 13 percent, a gap that has continued to widen over more than a decade. Kusmin believes the disparity reflects the greater employment opportunities and higher earnings available to college graduates in urban areas. “A better understanding of the opportunities and constraints facing adults in this educational attainment group may be important since it is likely that many who pursue post-high-school education will continue to end their schooling with something less than a four-year college degree,” says Kusmin.